= Diplodon (s.s.) rhombeus (Spix, 1827). — Pereira et al. (2014). 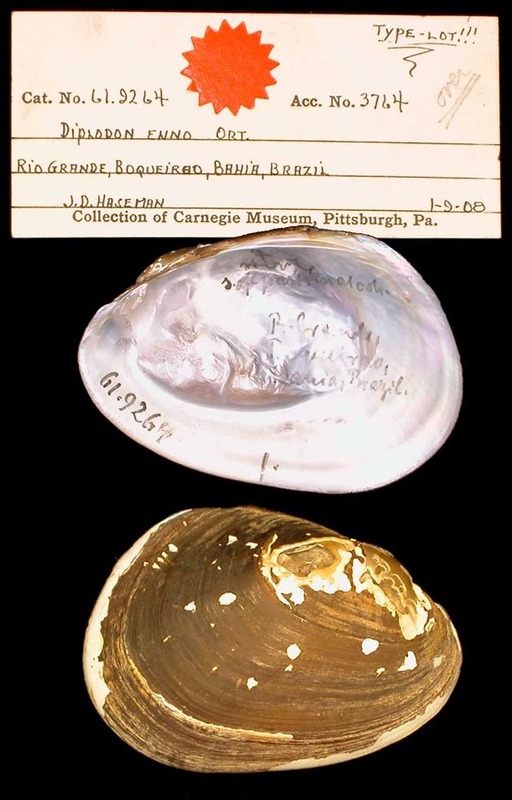 = Rhipidodonta rhombea Spix & Wagner, 1827. — Bogan (2010). = Rhipidodonta rhombea (Spix & Wagner, 1827). — Graf & Cummings (2007). = Rhipidodonta rhombea (Wagner, 1827). — Simone (2006). 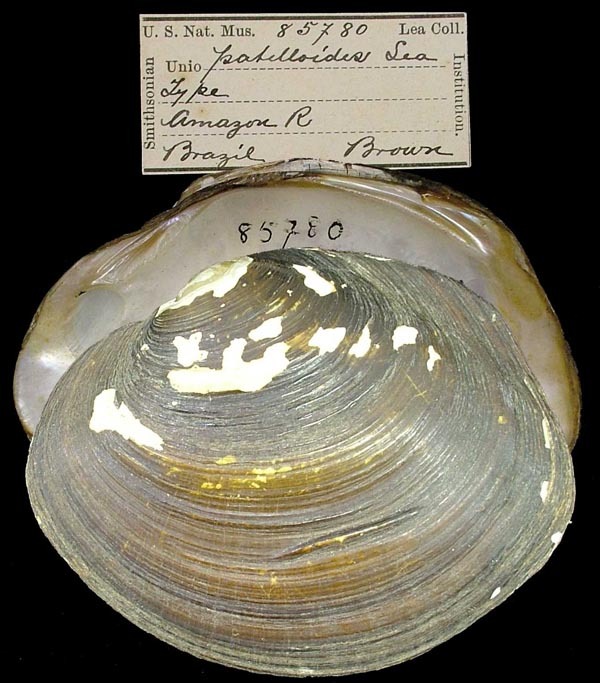 + Diplodon paranensis (Lea, 1834) Simpson. — Quintana (1982). = Diplodon (Rhipidodonta) rhombeus (Wagner, 1827). — Haas (1969). 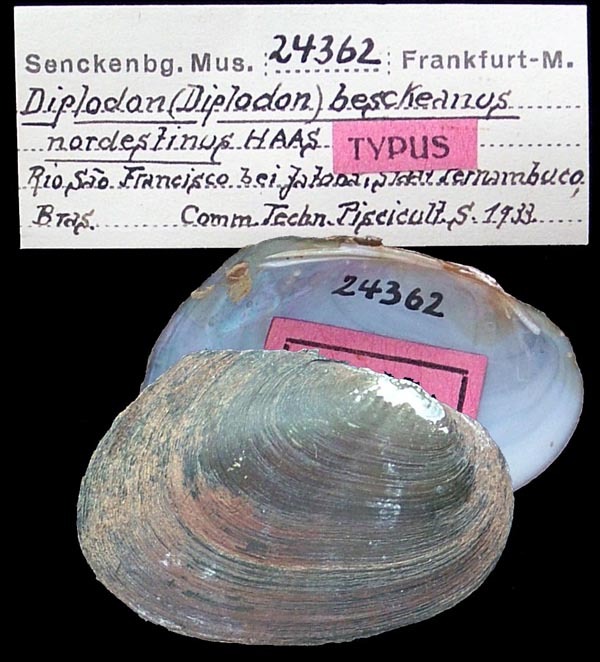 + Diplodon (s.s.) delodontus enno Ortmann, 1921. — Haas (1969). + Diplodon (s.s.) besckeanus nordestinus Haas, 1938. — Haas (1969). = Diplodon rhombeus (Wagner in Spix, 1827). — Parodiz (1968). + Diplodon paranensis (Lea, 1834). — Parodiz (1968). Diplodon rhombeum Spix & Wagner, 1827. Spix & Wagner, 1827, Test. Fluv. Brasil. : pl. 28, figs. 1-2. Unio rhombeus Spix & Wagner, 1827. Spix & Wagner, 1827, Test. Fluv. Brasil. : 34, pl. 28, figs. 1-2. Type(s): SYNTYPE SMF_3866, Rio Solimoes, Amazonas Geb. Bras. Ortmann, 1921, Mem. Carnegie Mus. : 531, pl. 38, figs. 5-7; pl. 46, fig. 7. Type(s): LECTOTYPE CM_61.9264 (selected by R.I. Johnson, 1977), Rio Grande, Boqueirao, Bahia, Brazil. Diplodon (Diplodon) besckeanus nordestinus Haas, 1938. Haas, 1938, Arch. Moll. : 46, Abb. 1-3. Type(s): TYPE SMF_24362, Rio Sao Francisco, bei Jatoba, Staat Pernambuco, Bras.